Fibonacci discovered a series of numbers that appear relevant to many things in nature. His series has been named the Fibonacci Sequence. 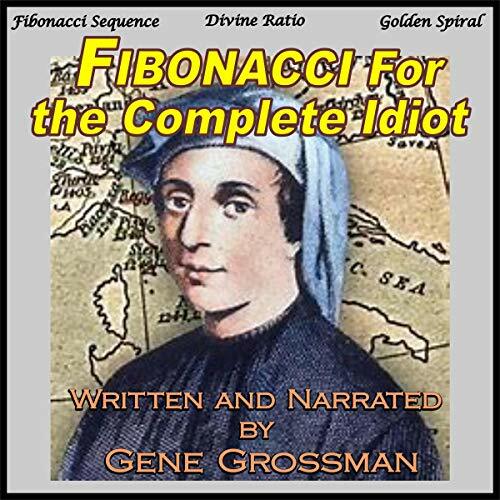 He then went on to discover that there is an mathematical relationship between each of the successive numbers in his sequence, which was then called the Fibonacci Golden Ratio. And to make matters even better, but more complicated for the non-scientist to completely understand, Fibonacci learned that a natural curve that exists, an example of which is the one that a wood shaving resembles when using a plane device on smooth down a surface. It is now referred to as the Fibonacci Golden Spiral. The problem with all of these wonderful discoveries is that all most people do is talk about the simplest ones to calculate: the Fibonacci Sequence, because all you have to do is add two numbers together in a particular way, and you have it...but people rarely go deeper than that, so Gene Grossman decided to - and has done with this Fibonacci book the same thing he did with the popular books he wrote entitled Celestial Navigation for the Complete Idiot and Trigonometry for the Complete Idiot: He wrote plain-English explanations that even kids above the age of eight should be able to easily follow - and explain to their parents.... And it goes the other way, too. Like in his other books, there are plenty of explanations and the author's confession about some personal matters and description of the subjects he delved into that he believes will make anyone who listens to this audiobook have better self-esteem. He also guarantees that if you listen to this entire audiobook you will definitely know more things than you knew before you listened to it.